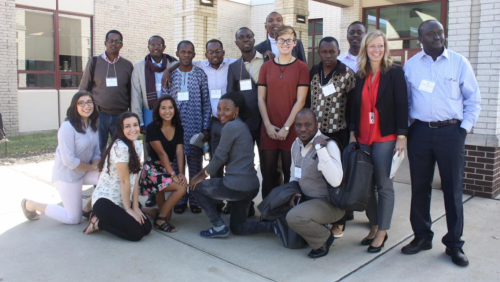 Beginning on Tuesday morning, September 16th, a little after 9 am, the video conference room packed with journalism students, Key Club members, administration, teachers, and their honored guests, professional journalists from several countries around Africa. They came to experience and witness the American presidential elections and how these elections are addressed in schools, due to the fact that most of them report on the political systems of their own countries. Mr. Kipkemboui and senior Sierra Hartings pictured in front, discussing Journalism and current events. Senior Abigail Oberdick, also pictured, researched the work of Mr. Yassin Wardere, a Somali journalist, before discussing the dangers of reporting in his home country. Many of the visitors had plenty of questions for the students as well, asking about how politics are taught in the school, student government, etc. They were very interested in the success of a journalist in America because in African countries being a journalist is still considered a very prominent, well-paying career. They felt very strongly that print journalism will last forever, even though in America the journalism world seems to be overtaken by technology. After the quick breakfast and chat, the Key Club officers took to lead the visitors on an extensive tour throughout the high school. They took a particular interest in the foods room, stopping to chat with Mrs. George about dishes from their native countries. Next, the tour stopped into the french classroom where the level four french students were about to take an exam, but were interrupted by eager journalists who were immensely excited to speak in one of their first languages to the just as eager students. They ended the tour off with a visit to Mr. Aguiar’s fourth period Problems of Democracy classroom where the class was discussing the 2015 Republican GOP debate. They were able to hear students views on American politics and contribute their own opinions. 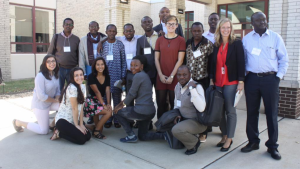 The journalists increased the students understanding of journalism and politics around the world by bringing their unique knowledge, cultures, and experiences to Avonworth. Upon departure, the journalists from Africa and a handful of Key Club members gathered for a group photo outside of the high school office.